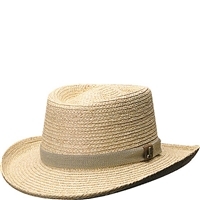 This boater hat is made of 10/11 mm Laichow braid and features a 24-ligne stripe grosgrain trim and a 2" brim. 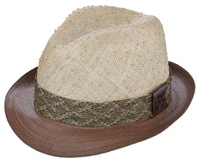 The Scala toyo safari hat is constructed of 100% toyo with quality that you can see and feel. This hat features an almost flat 3" brim that will keep you well protected from the sun, as well as a 5" crown designed with breathability in mind. The crown of the hat is wrapped with a leather band at the base, and it comes with an adjustable leather chin strap. 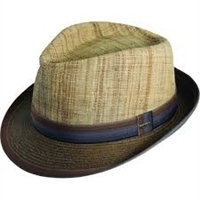 The inside of this hat is unlined and has a very soft and comfortable foam/cotton sweatband.